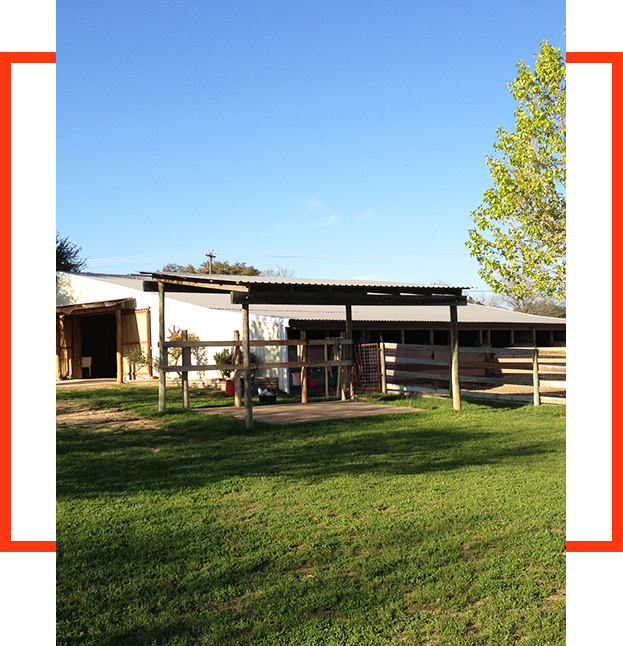 We have a 33-acre ranch with a 10-horse barn and five, large run-in shelters for pasture care. 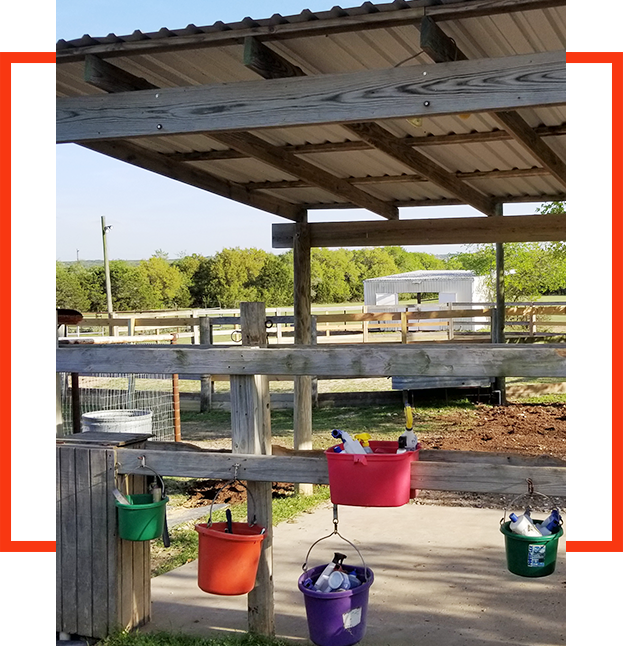 We have a covered, cement wash rack with room for four horses and plenty of hot water to give warm baths. Our fences are made of 4 x 2" no-climb wire and almost all fences are 5 feet in height. 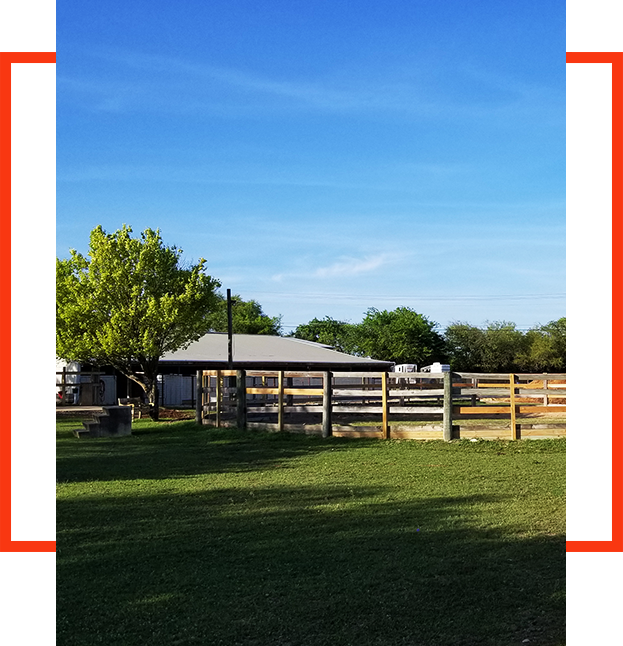 We have a large arena with pipe fencing and excellent footing and a 60-foot in diameter round pen with safe fencing for ground work and lunging horses. Our "down-the-hill" neighbors sometimes allow us to trail ride to Barton Creek, providing beautiful trails down along the creek. This gives us a break from arena work when our horses need a change. It is a breath-taking, quiet trail ride. We have replaced almost every fence on our property with 4' x 2' no-climb "horse wire." Many of the fences are pipe strung with no-climb wire. Nearly all fences are 5 feet in height, keeping horses safe from their curious neighbors. We do our best to prevent injuries before they happen, and walk our fences regularly to check for repairs that need to be made. Our covered wash rack stands several horses at a time for baths, grooming or medicating the horses. We have hot and cold water available to spoil our horses with warm baths in the winter. Each boarder can store shampoo and medication at the wash rack in individual buckets provided. 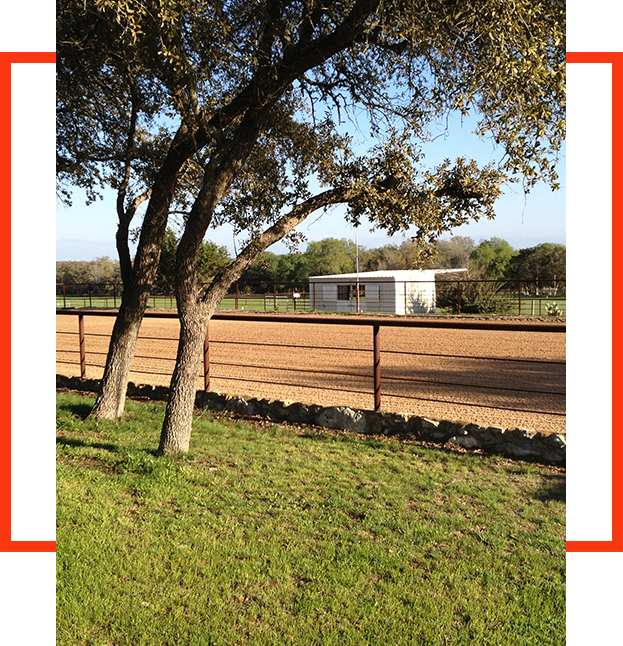 The cover, as well as the trees with horse ties, gives owners plenty of shady space to allow horses to dry after a bath, or simply to groom and play with their horses. Horses need to graze. 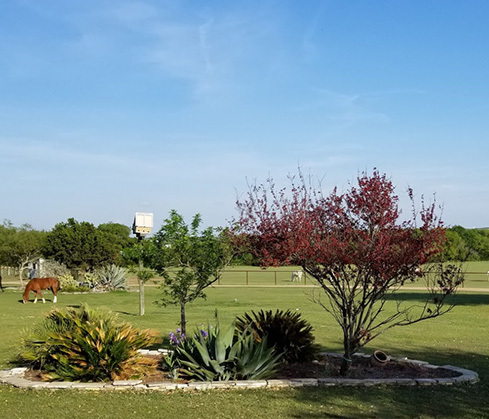 So we work hard to keep our pastures at Austin Stables looking great. We spread or remove manure weekly and plant seed and fertilize as needed to keep it lush. Each separate pasture is 3 to 10 acres and holds only 2-5 horses, so they have lots of room to graze without being over-crowded. Providing Mother Nature gives us ample rain, there is typically grass year around for the horses to enjoy. Shade trees line the back side of most of our pastures. 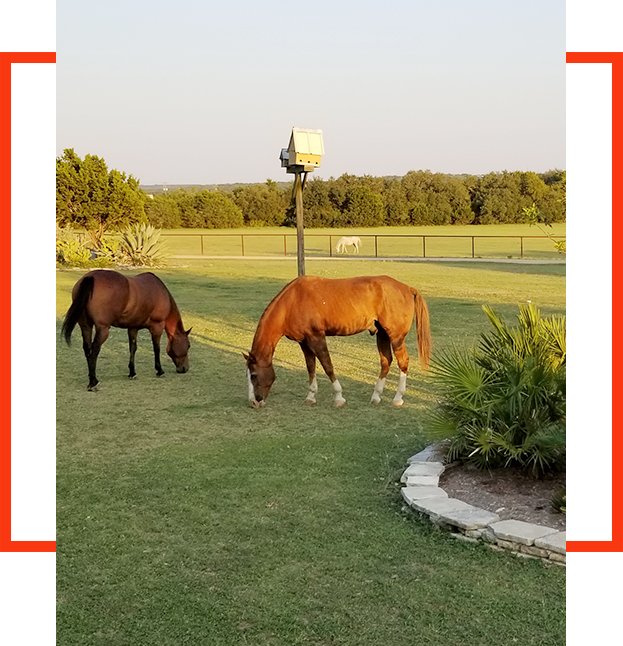 This gives pasture horses plenty of diverse space-- grassy pasture, loafing shed with #1 horse quality coastal hay, and trees and shade to relax or graze. Most pastures have two or more water sources. We keep tanks and buckets clean by scrubbing them all weekly, or more if they need it. You will never see a dirty water tank at Austin Stables. Our 60-foot round pen serves many purposes. It provides a safe place to start young horses under saddle; offers the necessary boundaries for horses learning to free lunge; and serves as back-up turn-out for stalled horses if regular pastures are too muddy to use. We researched many options before deciding how to build our arena. It is great for working any horse for maintenance of any discipline with a hard-packed base under 3-4 inches of soft, fine, masonry sand. 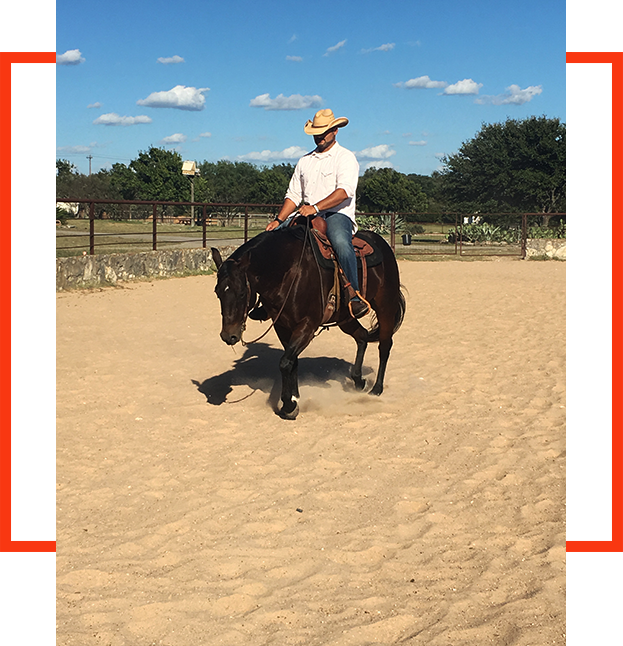 It was specially designed for reining horses and while it is versatile, it is not designed for fast barrel racing practice, or for cattle work. It is groomed/dragged regularly. We maintain the footing by keeping the sand moist and by dragging it often. The footing has been complemented and appreciated by riders and trainers of many types of riding disciplines. We have a water trailer to wet the arena in dry times when needed. 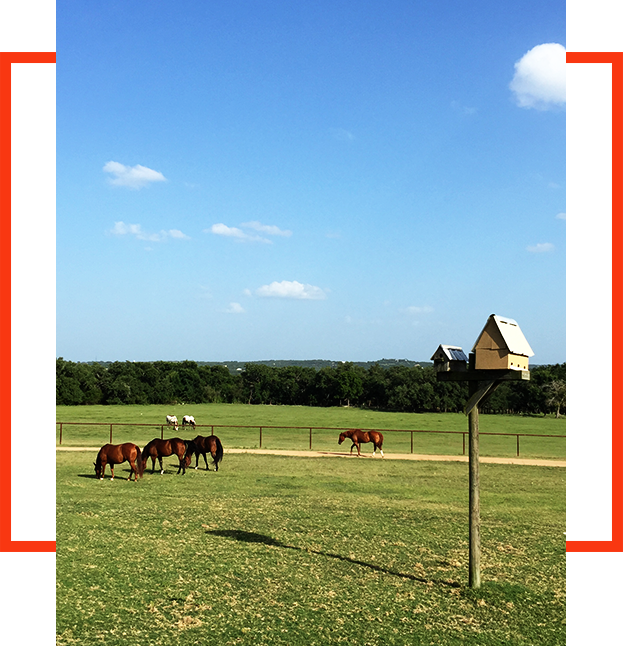 Our home is situated such that we are able to see most of the pastures from our windows. We encourage boarders to "knock on our door" if they have a problem or question. You can see out into the Austin hill country from almost anywhere on the property. When the sun sets in the summer, the shadows get long across the riding arena and it cools off quickly. The property is on top of a long, gradually sloping ridge so there is almost always a breeze.